This is one of the most sought after recipe from my mom in law. She makes one of the best beef pickle. Like most mothers, she doesn’t have measurements; it’s all a work of hand. This time, I stood beside her and measured all her “little of this and little of that”!! 900 gms beef (frozen or fresh) cleaned and cut into small cubes. 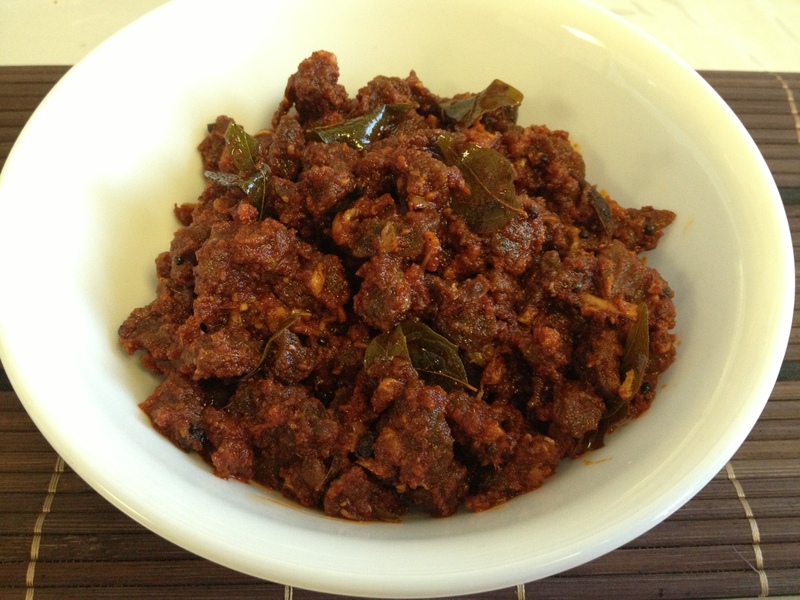 Cook beef cubes along with cloves, cardamom, curry leaves, peppercorns and cinnamon in a pressure cooker till done. (Make sure the beef boils and give it a good stir before you close the pressure cooker. This way, all pieces will remain separate when cooked). Heat oil in a large kadai/pan. Add 3 sprigs curry leaves and fry till crisp. Remove and crush and add to beef. When it splutters, add ginger and stir for a few seconds. Add garlic and rest of curry leaves and stir for 2 minutes on medium flame. Add ginger/garlic paste and stir well. Stir well till raw smell goes and everything is fried well, but do not make it brown. Wait for a minute and add chili powder, turmeric powder, garam masala, fenugreek powder and asafetida. Stir well. (This way the powders will not get burned). Add vinegar and salt, stir and keep back on the fire. Let the mixture simmer for 1 minute. Take off fire again and add the beef pieces. Stir well. Add little vinegar to the water to wash beef, all impurities will be washed away. Kashmiri chili powder will not be that spicy, so use according to preference. If you are making large quantities of beef pickle, boil and cool vinegar before you add to pickle. 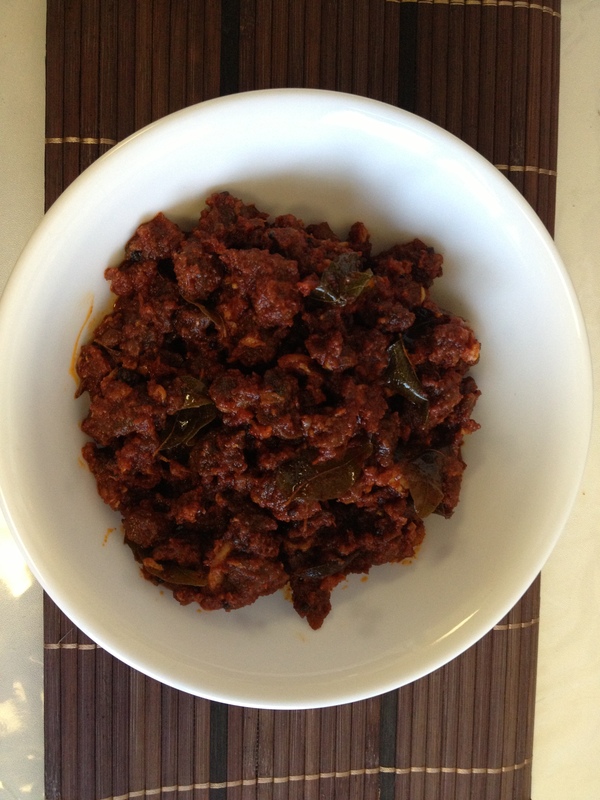 This entry was posted in Chutney /Pickles /Raita and tagged beef achar, beef pickle, irachi achar, meat pickle by PriyaBaby. Bookmark the permalink.